SLED Security Training- security officer training for South Carolina. Our SLED Certified Security Training is above and beyond what is required. When you leave our class, you will have a better insight of what you can and cannot do as a SLED Security Officer. Our SLED Security Training for Security officers is affordable and will get you ready for a new career. 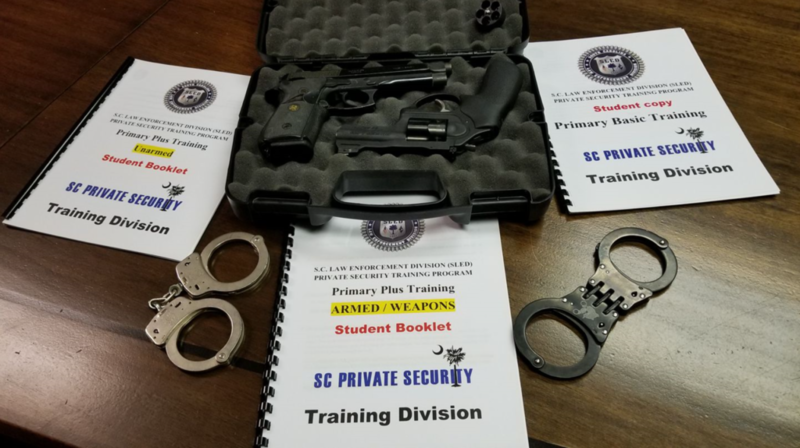 Primary Plus: (Optional) This class is basically an upgrade to certify you in many things such as Handcuffing, Use of force and Handguns. This class gives you the same authority as a Sheriffs deputy on the property you protect. YOU CANNOT take this class unless you have been to the “Primary Basic”. You can take both “Basic” and “Plus” in the same day. 8 hour class. All SLED Certified Security Officers are required to have “Primary Basic” at a minimum. NOTE: When you get done with any of the SLED training regarding “Primary Basic” or “Primary Plus” you will not be certified at that instant moment. YOU WILL have to send in your application to SLED with the training records from our company, with the SLED fees, finger prints, photo, etc. We walk you through this whole process. Once approved by SLED, then you will be an “official SLED certified officer”. To visit SLED’s website to see if you are you ineligible?